One of the reasons I live in the Arizona desert is the snow-free winters. I don’t hate snow, I just don’t want to live with it. But these snow-free winters mean a lot of our students have never seen snow and that’s a shame because the snow can be a lot of fun. So…. I use books to bring the fun of snow into the classroom without living in the cold and mess! The Story of Snow by Mark Cassino. This link will take you to a free teacher's guide! Snow by Cynthia Rylant, a young girl enjoys a day in the snow. this link will take you to a brief activity guide for the book. 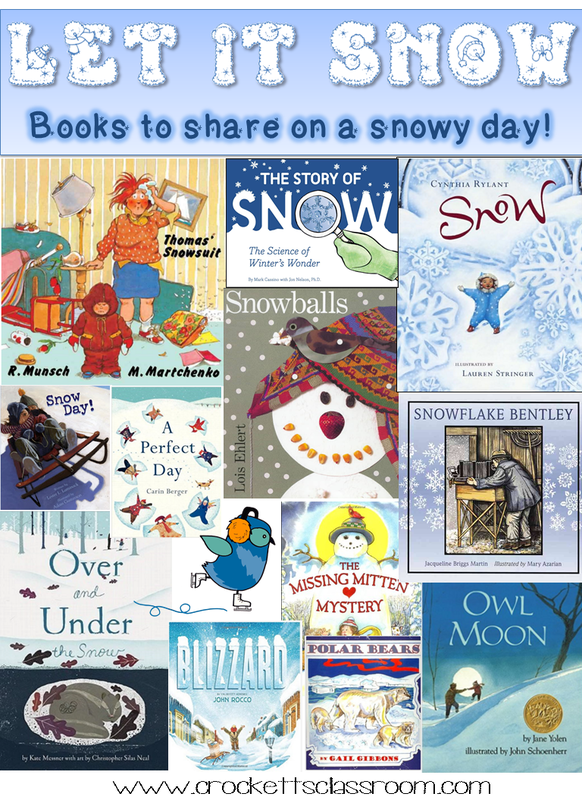 Snow Day by Lester Laminack, This delightful story puts a twist on "Snow Day." A Perfect Day by Carin Berger, This book paints a picture of a perfect day in the snow. Snowballs by Lois Ehlert In this beautiful books students will enjoy the collages used to make the pictures. The link goes lesson ideas for this book. Over and Under the Snow by Kate Messner, A wonderful informational text about life over and under the snow. The link will take you to lesson ideas. Blizzard by John Rocco This book is based on true experiences by the author. The link will take you to a book trailer. The Missing Mitten Mystery bySteven Kellogg, After a day of playing in the snow a little girl discovers one of her mittens is missing! Where could it be? The link goes to a site with free lesson ideas. Polar Bears by Gail Gibbons Another wonderful book filled with interesting facts about these giants of the north. Owl Moon by Jane Yolen In this nighttime adventure a girl and her father go searching for owls on a moonlit winter night. The link takes you to lesson plan suggestions. 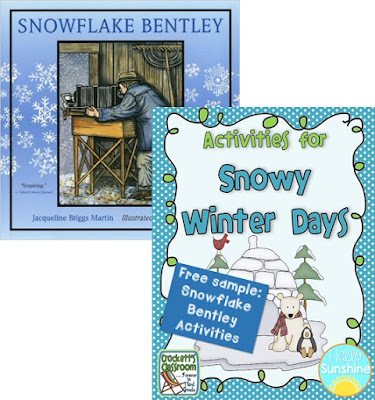 Snowflake Bentley by Jacqueline Brigg, (the link takes you to Snowflake Bentley's official website) I saved my favorite book for last. This beautiful book was introduced to me by a good friend who lives in Vermont. One year she sent me the book along with a snowflake print from Bentley's collection as a Christmas gift. I instantly fell in love with the book and used it in my classroom every year. You can download a free activity to go along with this very special book.